NEW YORK, NY, US, September 12, 2018 /EINPresswire.com/ — Legend has it that Paul Revere rode through the midnight countryside exclaiming, “The British are coming!” At the same time, industrial technology – a revolution in itself – was advancing another world-changing movement at an equivalently world-changing rate. Now, almost 250 years later, enhanced efficiency and quality of life are the alternatives to muskets and sweat shops. The Digital Revolution requires no victims. “The bots are coming!” is not an alarm or warning. The call to arms is one of encouragement and absolute fact that should be embraced. Revolutions come and revolutions go. None have impacted the business world as has the escalating Digital Revolution. Accounting, inventory control, customer service, marketing and management itself increasingly rely on technology. While many commercial icons have closed their doors, many other Mom & Pop small businesses, startups and cottage industries have grown exponentially. The common denominator between success and failure has been “choice” … the choice among a business model stuck in the 1990’s, barely surviving in the 2010’s or thriving into the 2020’s and beyond. AI, Machine Learning, FinTech, Cryptocurrency, among countless others, are not terms or concepts to fear … nor is the pervasive dominance of technology among all facets of daily life. Weaving looms, the printing press, indoor plumbing, light bulbs and automobiles were only a few of history’s milestones that had been demonized in their times. As intimidating as any acronyms and nerd jargon might first appear, their same fundamental tools now provide a comprehensive spectrum of information, guidance and advice for novices, experts, CEO’s, entrepreneurs and small businesses. As an example, among all gurus’, Internet and hard copy publications one rises above all others as a true authority in the transformation to, grasp of, “Digitalization”. 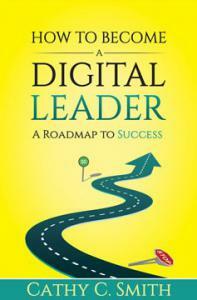 Cathy C. Smith has just released her most recent book, How to Become a Digital Leader: A Roadmap to Success. The language is not only an “easy read", her entertaining style is technically-informative for an audience of corporate executives or curious consumers. The lessons and message also transcend business or profit, addressing everything from personal health to the child safety. Her personal statement, in response to a question from the press, was last week, “I see digitalization as a boon to business profits, but also to everyday people and their opportunity to enjoy life, protect the environment and raise their families. In my profession, I make the complex simple and relevant. This book likewise achieves that goal.